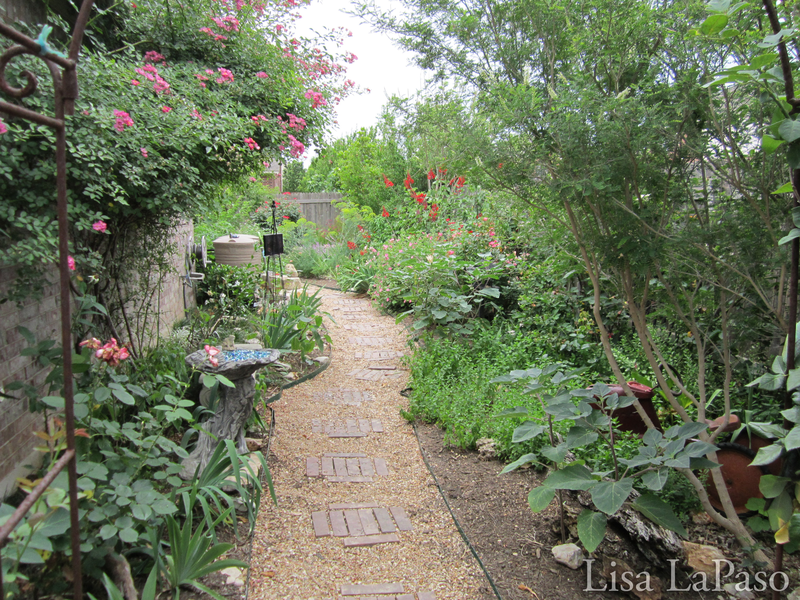 How do you create the garden of your dreams on a shoestring budget? Well the first ingredient is patience because clearly you are going to have to prioritize and pace yourself, but I think I have some suggestions that may help you get started. First you need to make a plan, either by hiring someone like myself for a consult or design or by writing your priorities down. Perhaps you are in need of shade, or maybe you have shade and want some color. A consultation for $100 an hour can save you hundreds on bad plant choices and you can pick a professionals brain for clever, inexpensive solutions you may not have thought of. “Put your money where your MULCH is! !” Prepare your beds and fill them in with mulch. I recommend covering your sod with 4 mil plastic, staple it down with landscape pins and fill in with 6″ of mulch. Allow the grass to cook beneath the plastic for several weeks to kill off the sod beneath before planting, summer time is the best time to do this as you won’t be planting then anyway. Once this is completed you have incurred the expense of the bed prep and materials and it is ready to be planted in when you find a bargain plant in the fall or spring. This helps save on the cost of having your sod removed which can be very expensive , or time-consuming if you do it your self not to mention where does all that sod go? Using shredded mulch is important because it holds moisture well, creates a weed barrier and doesn’t float. When planting in plastic, be sure to perforate the plastic with a pitch fork and cut out large holes in the plastic where your first plants and trees go. Once the grass is dead the earth beneath it becomes soil you can begin to remove large areas of plastic for planting. If you leave the plastic on over the hot Summer or Winter months, the Sun will cook the sod beneath and by the time you are ready to plant, the sod will be dead. Aerating the plastic keeps the soil from dying, or you can remove the plastic as soon as the grass dies to avoid this. If you have a lot of weeds, do the later. When you are plant shopping, be sure to take a plant list so you do not impulse buy a plant that does not work in your space, or worse yet does not belong here! Xeriscape means low water plants not cactus necessarily, but native plants that take our drought and heat conditions. Go to your local nurseries and ask if they have plants that need a good home at a discount. They may look a little shabby but with a little bit of root simulator and some TLC, they are good as new. Just be sure to look at the roots, if they are rusty or smell badly leave it alone, it has root rot from being over dry and over watered and probably wont do well. If I see a table full of plants looking bad, or a specific plant looking sparse I ask for a discount. Ask for the manager, even at the big box stores all they can do is say no. I do this ALL THE TIME!! ” Ain’t no shame in my game”, I figure a $2.00 plant is even better than a full priced one and they all do the same thing… grow. Invest in rain barrels it is free water, you aren’t going to get a better deal than that. They pay for themselves the first year. You are going to be very happy with the results as rain water is way better than city water, no chemicals and your plants will love you for it. Always be sure it is thoroughly screened in so you aren’t growing mosquitoes. While you are saving $$ for plants, fill in your garden space with junk shop items that add artistic interest. All sorts of crazy things can be garden art, maybe even things in your own home. An old Iron bed can define a wild seed bed space or some adopted Iris bulbs, an old rusty bike, a bottle tree made out of wooden doll rods and colorful glass bottles can be an interesting filler. Bird houses you buy at the goodwill or a garage sale, wagon wheels, interesting rocks you have collected or brightly painted patio furniture and pots placed in your garden space can fill in the empty space you aren’t ready to plant in. As for affording labor, prioritization is really important here too. Instead of a stone patio which is impervious cover that doesn’t hold water, add stepping-stones with crushed granite in between them. This is cheaper for both materials and labor. Hire neighborhood kids to help mulch, plant and weed. Have a garden party with food and refreshments and ask your friends/family to pitch in, and you will help them next time. When dealing with irrigation or the lack of, there are great ways to cut cost here too. Obviously it begins with your soil. Yes, the soil. Be sure each spring to compost all of your beds, mulch deeply and plant the right plants for the job. If you are a handy person, there are hundreds of great videos showing how to convert spray heads into drip or how to move your heads for better lawn coverage, but if you aren’t comfortable hire a professional irrigation specialist top set up your new beds once you have defined them. If you do not have irrigation, buy quality drip line and weave it throughout your bed in short lengths for best results and pressure. Then attach a splitter to your garden hose with a digital timer and run a garden hose to o your soaker hose, or hoses and you are good to go for a fraction of the price. Yes, it is more labor, but we are on a budget so this is a matter of priority or it isn’t. Never install a patio over your irrigation, have it relocated to be safe. Don’t skimp on hardscapes like edging and stone. These are permanent changes and they should be quality so take your time with these items and trust them to the referred professionals or hire a landscape consultant to show you the ropes. Your great idea for crushed granite may be your new nemesis if you lay it in the wrong place. If you have a water issue you need larger rocks. The smaller the Rock the more fluid it becomes. With mulch, the larger the prices the more buoyant they are. thinking outside of the proverbial “garden box” may be what is needed on a budget. Look through magazines and check out garden books at the book store for cool idea’s and designs. Take some chances and embrace your wild side. The garden is an experiment, enjoy the ride.